Taking an objective look at our assets may lead to us acquiring high performing and/ or selling investments that are not performing as well as we hoped they would. At some point it gets pointless to hold on to an asset that does not yield expected returns. If one cannot rework the returns of a particular asset, they may as well get rid of it completely. We don't want to waste our time and energy on an obvious loss. This is the situation we find ourselves in right now with a few of our properties. These particular units are not performing negatively, but have overtime fallen outside our target market. I am not the one to manage a strategy that lacks focus. We will try to price them to go rather quick. The other obvious factor is our growing focus on risk. You may have noticed that I have been writing about rebalancing our portfolio based on risk reduction and the incorporation of savings bonds into our assets. It is all explained in this one post, hopefully. One of my main interests is building on passive income. I am obviously planning on being location independent and working or playing wherever I find myself in this planet. This is the reason I love writing and investing. 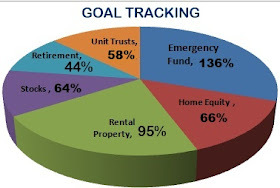 Our ideal portfolio should incorporate real estate, stocks, retirement funds and savings bonds. Our passive income sources are rental from property and a small amount from dividends with semi passive income from a small online business. Getting rid of a portion of the real estate investment will help grow our portfolio across various asset classes. This does not mean that we are done growing our real estate investments though. My ideal asset allocation is currently largely based growing the net worth whilst taking risk levels into account. We do wish to acquire more assets and grow them quicker i.e. stocks. However, with the markets having a mind of their own, we would be more comfortable with a balance between real estate and stocks. And of course bonds are great to preserve some of our funds. Let us not forget the importance of the retirement funds, especially given their tax benefits. Given the current state of our portfolio, we will most likely take some of the proceeds from the property sale into the stocks. Whilst that is a bit unlikely, it is a possibility. The most likely method for us would be to get the income from the rental property into the stocks every month to grow the stocks. We also need to start with the savings bonds by growing the existing savings accounts (partly emergency fund) which later have to feed into the bonds every year. To simplify the last statement: The savings accounts which are stashed in the money market accounts at the moment will have to be grown and used to invest into the savings bonds every year. Every month, a specific amount of money is transferred into the money market accounts. I don't prefer to have my interest reaching a taxable amount. This is the reason I am looking forward to building the bond ladder. Rebalancing your portfolio should be among the most important annual personal finance events in your life. I will be tracking this balance monthly as I check on my personal finance excel spreadsheets. Hope 2015 will be our best year ever. Thanks for your love, questions and support in 2014. Let us grow together and do even better.